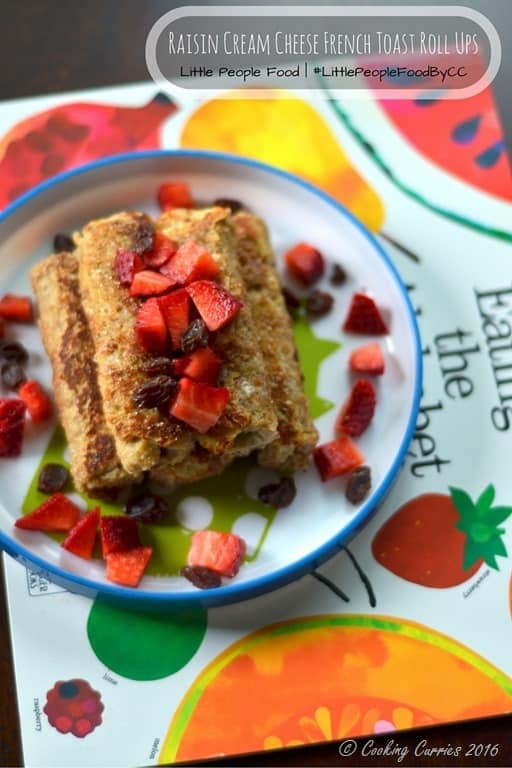 A fun and easy to eat, Raisin Cream Cheese French Toast Roll Ups, for your kiddo’s breakfast plate, lunchbox or snack! When V was little, up until he was 18 months or so, I used to make a special meal just for him, whether it was for breakfast, lunch or dinner. He would eat whatever we ate but I still wanted to make sure he got his full share of protein, veggies, fruits, grains and all that. And that sometimes would not happen if he ate our dinner or lunch or breakfast. Because, c’mon, how much every you want to and try to eat healthy, it is just not always possible. Such dinners were more than what I would like to admit. Especially when V was younger. But I always made sure, I added something special just for him, so his meals were all complete, balanced and healthy. Slowly as he started getting older, I was able to spend more time making a good meal for the family as a whole, as I had a little bit more time on my hands. Then again, there are times when I make his food a little bit more interesting, just because. He loves French Toast roll ups as he can just pick it up as a whole piece and work his way through it. The filling which I sometimes make a big deal of it being a surprise is a huge thing for him and he loves it. 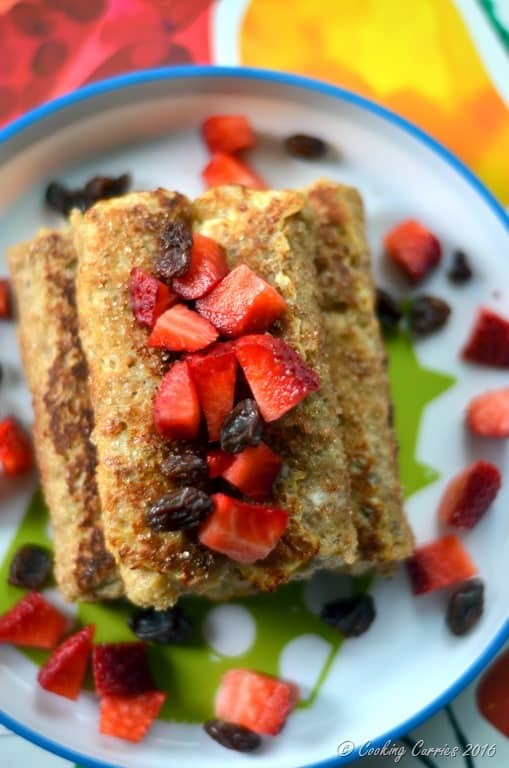 We, as a family, would all have the same French toast on the menu for breakfast. Only thing, V’s had a filling and was a roll up to make it more interesting and fun. That way, it wasn’t a whole lot of extra work for me and that extra cream cheese and raisins in it helped him too. I would sometimes roll it up in sugar, cardamom-sugar or cinnamon-sugar or sometimes drizzle some Organic maple syrup over it. I would let that be the things V gets to decide on, so he feels like he contributed to what he was being served for breakfast. It helped him feel he has some control over something, but this mama controls that. So everyone is happy! I dip it in the egg mixture and toast it. I have seen that anytime V helps me in the kitchen, he is so much more excited to eat what he “made”. It is a good way to make them try new things. They get so excited that they helped make it, that they will not throw much of a fuss to eat it. Do you cook with your kids in the kitchen? If so, what is your favorite thing about it? I would love to know! 1/4 cup sugar, for rolling the roll ups in or 3 tbsp maple syrup to pour over the roll ups. Cut the crust off the slices of bread and roll each slice out a little. Spread some cream cheese over each slice. Arrange the raisins on top of it. Beat together eggs, whole milk, cinnamon and nutmeg. Roll the bread slices and dip in the egg mixture well. Heat a little butter at a time on a skillet over medium heat. Place the rolled and dunked bread slice on the skillet. Turn over the roll after a few minutes. Once the roll is browned all over, remove from the skillet and place it on a plate with sugar on it. Roll it in the sugar while it is still hot. Or instead of the sugar drizzle some maple syrup over it. 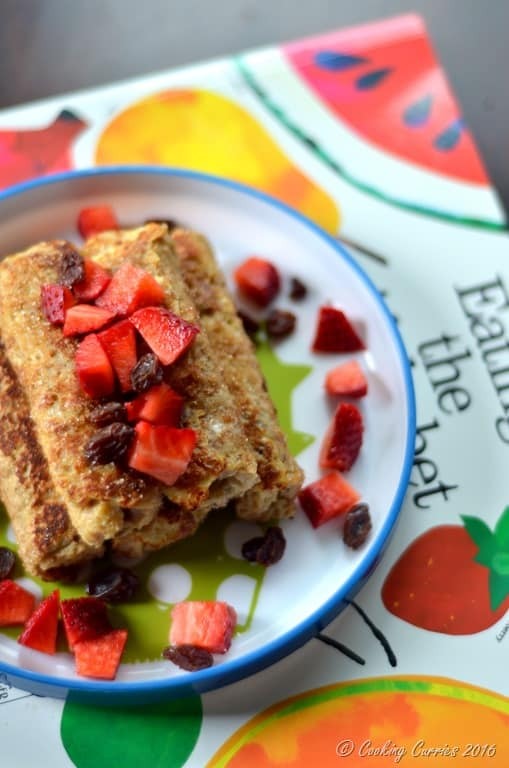 Serve with your kid’s favorite fruit. Sounds like a delicious sweet treat! Fabulous that you have used organic produce too. What a cute idea. I know my kids would love these! This is a nice little addition to the weekend brunch. I have a friend who loves raisin pie…I can image he would love these too. How fun is this recipe! I can’t wait to try it out the next time my nieces want to have a sleepover! My kid is too small for these yet, but I would eat a bunch of these with a pleasure by myself. Yum! Haha! Thanks Igor! And yes, I do that too. I make extras just so I can eat the rest. Shh! Oh my gosh! What a wonderful idea for comfort food recipe! Looks heavenly. These roll ups look so good! What a great idea to get your little one to help out in the kitchen! I don’t have any children, but my niece came to visit last week and we spent lots of time in the kitchen. It was so fun! It would be great to have a little one at home to help!!! 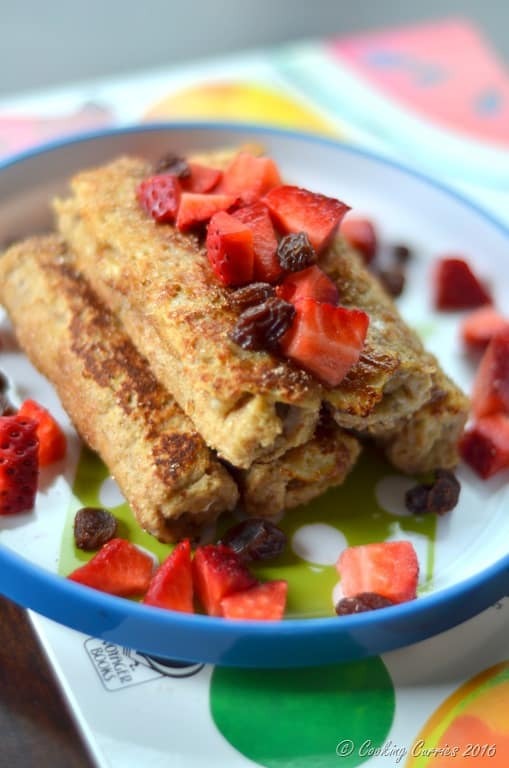 And your dish, I can see how your yummy French toast roll ups would be a real hit with the big and little kids!! Fun way to get kids involved! And the dish looks super delicious.